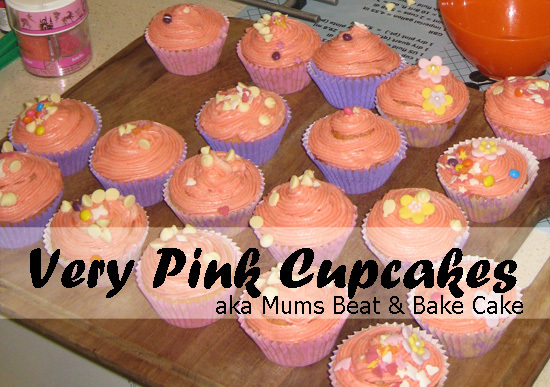 Being a very girly house that this is (poor Flower Daddy - 2 girl dogs, 2 daughters and a wife to make him suffer), we rather like pink cupcakes. Pink cake AND pink icing! Sometimes, just sometimes, we add blue sprinkles to the topping - for a bit of added manliness. He doesn't complain. Just as well, or us girls would eat the lot. 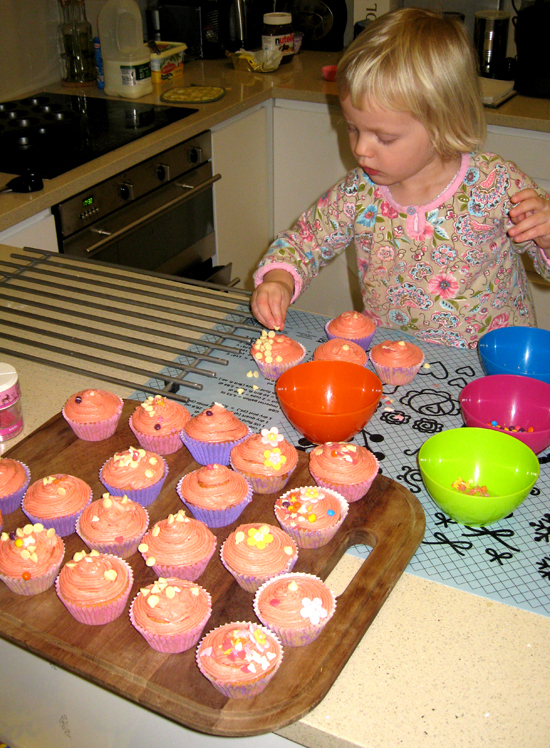 These ones are quite a lot Pinker than our usual pink (see the blue sprinkles? )...the photo is pretty rubbish too. This icing was icing sugar, fresh lime juice, pink gel food colouring and a little water to make the icing easier to spread. 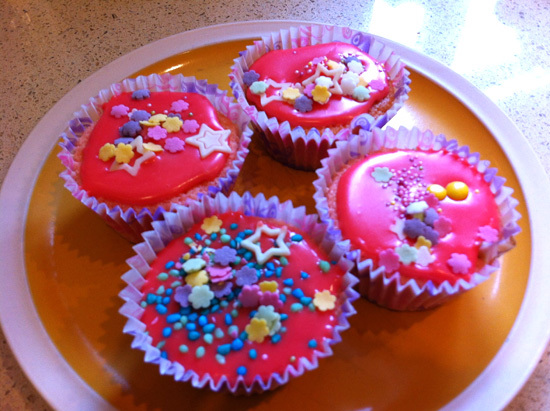 These are more typical of our usual pink cupcakes. Pink butter cream icing with pink sponge hiding underneath. Not a crazy glow in the dark sort of pink, more of a respectable and edible sort of pink. I'll have to take a photo of the sponge next time we bake them. Much concentration and enjoyment goes into the decoration and eating of them. The recipe that I like is actually my moms Beat and Bake cake recipe. When we were kids she would double it and make a massive tray bake cake. I remember the icing being either chocolate or granadilla flavoured butter cream icing. Yum! It makes a lovely flat topped cupcake. 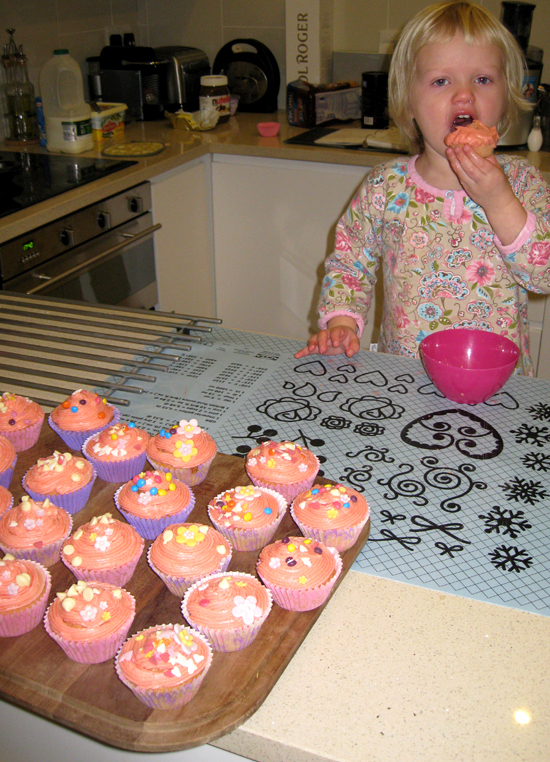 If you fill the cupcake cases 1/2 way, you can easily spread a runny icing on top without losing it all overboard. Fill the cases about 3/4's for a piped icing finish. Heat your oven to 180 deg C.
Chuck all the ingredients into a bowl - I use my Kenwood electric mixer - and beat slowly until everything is nicely combined (about 3mins).